A shoulder dislocation occurs when the head of the upper arm bone, the humerus, slips out of the socket formed by the scapula at the shoulder joint. 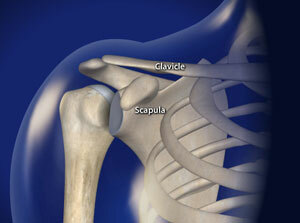 Because the shoulder is not as stable as other joints, this injury is common. A shoulder dislocation is a very painful injury, and requires urgent medical attention to get the shoulder back in place. A shoulder dislocation can result in damage to several structures of the shoulder. These include: fractures of the ball or the socket, labral tears (another name for this is a bankart tear), and rotator cuff tears. Younger patients who dislocate their shoulders have a higher risk of recurrent dislocation. This risk is about 90% in ages younger than 20, about 60% in ages between 20 and 40, and 10% in ages over 40. Young patients with a shoulder dislocation and are more likely to suffer a bankart tear (which is a tear of the labrum, or the ring around the socket). Older patients who dislocate their shoulders have a lower risk of recurrent dislocation, but are more likely to suffer a rotator cuff tear from the injury. Contact the office of Darren Keiser, Omaha Shoulder Dislocation specialist, to schedule a consultation.